Photo courtesy of Robert Nelson. 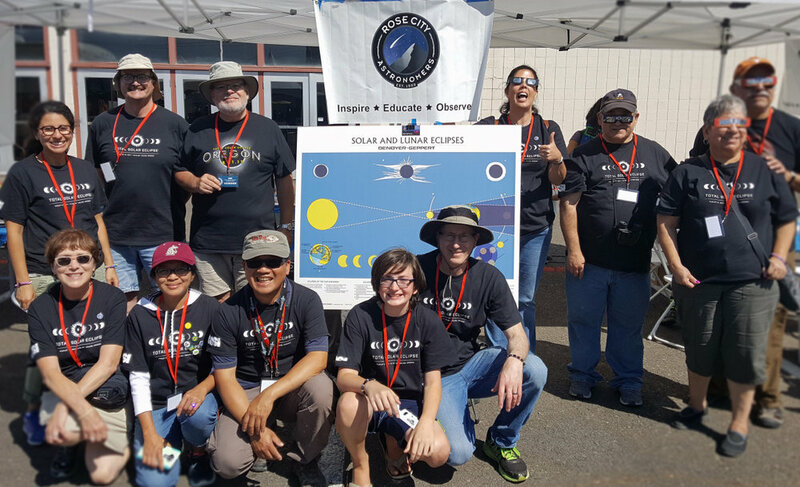 RCA Volunteers shared their time, telescopes and knowledge with over 1,000 people at the OMSI viewing party for the total eclipse in Salem, OR on August 21. Volunteers showed up Saturday afternoon to help set up and many slept overnight in the gravel lot of the Oregon State Fair Grounds to be ready for Monday’s early morning. With 14 wonderful volunteers, there were many activities to engage the attendees of the event. There were 7 telescopes set up for public viewing of the sun and Venus. There was also an eclipse diagram provided by Robin Baker, an RCA astro-photography display and an Oregon roadmap showing path of totality by Paul Salvatore. Lastly, there were activities for kids of all ages that included UV bead bracelets, moon phase wheels, and solar eclipse word searches. Many thanks to Robin Baker, Paula Frenchen, Yara Green, Bob Hansen (from sister club in Vancouver, BC), Robert Nelson and family, Mario and Maria Pedraza, Marc Singleton, April South, Mike Sutherland, and Do and Uyen Tran for their enthusiasm and generosity on such a spectacular occasion.